Basil is used on the skin for its antiseptic, antifungal and circulatory stimulating properties in applications such as treating acne, insect bites, ringworm, and also as an insect repellent. The linalol variety contains a terpene alcohol of which vitamin E is a main constituent, thus making it more healing for the skin. The essential oil of basil is often added to facial steams, cleansers, toners, hair rinses, soaps and perfumes. 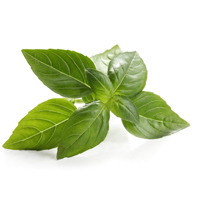 In hair products basil adds a delightful scent, improves hair growth and tames tangles. It makes an excellent energizing bath herb. Basil is stimulating to the mind and used for nervousness and exhaustion. See basil, sweet. The European Beech, often called the "ever-lasting youth tree," is a leafy tree with a remarkably upright and smooth trunk that matures after 60 years and often lives to be 200-250 years old. The extract from the mature Beech tree is used in skincare formulations to increase the health of the epidermis, stimulate the skin and as an antiseptic. Proteins accumulate help retain water through an osmotic effect which directly results in increased moisture. Beech bud extract is a unique organic active that brings a softer, smoother, more youthful appearance to the skin. Beeswax is a product made by bees to build the walls of their honeycomb. The substance is secreted by virgin honeybees in the form of thin scales and is practically insoluble in water. Beeswax is not absorbed into the skin, so it primarily protects the surface of the skin and traps water on the surface. It is a thickener but is primarily used as an emulsifier. Beeswax is used in many cosmetics including baby creams, moisturizing creams, eye creams and protective creams. It can be comedogenic on the face, so is best used on the body. Beeswax is also a natural sun protectant. The bergamot orange is small and roughly pear shaped. Its essential oil is derived from the cold pressed peel of nearly ripe fruit of the bergamot tree. The essence of bergamot is used in wide measure for skin and is one of the main ingredients of traditional cologne waters. Properties for skin include: antiseptic, balancing, deodorizing, refreshing, stimulating, vulnerary and warming. Bergamot is used in treating the following skin conditions: acne, blackheads, cellulite, sagging skin and seborrhea. The aroma of bergamot is described as a fresh fruity, sweet citrus top note. Properties for the mind include: antidepressant, balancing, calming, harmonizing, refreshing, uplifting and overall emotional wellbeing. Emotional benefits include ease of: aggression, disappointment, distress and grief. In fact, wearing the scent of bergamot aids in reopening the heart when it is closed from the pain of grief. Furthermore, bergamot essential oil is one of the most useful in the neuro-psychiatric field for the cure of neuroses, depressions and anxious states. Its solar aroma has the power to temper the emotional excesses, to encourage confidence in oneself and to re-emerge suffocated vitality. It has also been known to improve lack of appetite and morning laziness in adolescents. An ancient remedy, the herbal extract of birch bark is obtained from the European white birch tree. It is high in betulin and betulinic acid, flavonoids and terpenes, all powerful phytochemicals. Its properties for skin include: analgesic, potent antioxidant, astringent, circulatory stimulant, cleansing and freshening. Birch bark extract is good for bathing skin eruptions. Citrus sinensis peel oil is an essential oil expressed from the peels of the sweet Valencia orange. Anthocyanin, blood orange's red pigment, is a powerful antioxidant flavonoid that calms irritation. The essential oil adds a perfuming accent and is refreshing and uplifting. It is also known to soothe the mind and the body with its nurturing qualities, reducing stress an anxiety and providing a sense of well-being. Borage seed oil is the fixed oil obtained from the seeds of Borago officinalis, a blue-flowered European annual herb. 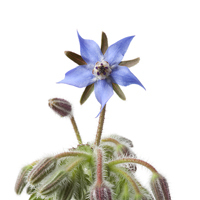 The soothing, cooling, mucilaginous substances in borage account for many of its medicinal effects. The herb is known to be rich in gamma linolenic acid, minerals and Omega-6 EFA all of which help to maintain healthy cardiovascular function, as well as healthy skin and nails. Borage is classified as an emollient and cleanser. Burdock root has many properties useful for skin including: antifungal, anti-inflammatory, antioxidant and demulcent. It contains polyacetylenes which are antimicrobial, mucilaginous and polyphenols. In skincare it is often added to facial steams, cleansers, lotions, toners and salves. Burdock root is used especially for the treatment of oily skin and may be used both internally and externally for skin conditions such as acne, eczema and psoriasis. It is also added to shampoos, conditioners and hair rinses, and can be especially beneficial for dandruff. Medicinally, burdock root is used to treat painful joints, inflammation and purifies the blood.